Ironically, I wrote a PRANK POST about this not too long ago. Egotistically, it’s a topic I’ve given far too much thought to over my years in New Eden. I’ve had people tell me that it’s not always about me, to which I’ve always replied “Of course it is. It’s my life.” This sentiment is something I believe strongly in. I’ve always pictured myself as the main character in my own life story. There have been many interesting chapters, with many supporting characters that have come into, and exited, the main storyline, but ultimately my life should be about me. It just isn’t logical to me for it to be any other way. Having said that, I’ve always been genuinely curious in the stories of others. Take this blog, for example, rocwieler.com. As the name implies, it’s about me, Roc Wieler. However, if you’ve been reading for a while you’ll find that every now and then I enjoy writing something completely unrelated to Roc, something about the average citizen of New Eden instead of the glorified life of the capsuleer. What you may not know is that many times those stories have been based on direct personal interactions I’ve had with strangers. I truly love people. Maybe not enmasse, but I do like to listen to the stories of the people who I cross paths with. They are always interesting, and sometimes motivate me to write in order to share the stories of those who may not otherwise have the opportunity to be heard. To the point of the banter, I wouldn’t make a Roc Wieler movie. Roc is but one small aspect of a much grander universe. I couldn’t possibly do it justice if I focused solely on me. When I look back at the different forms of media I have enjoyed the most, whether it’s movies, games, books, television shows or what have you, I’ve always been fascinated with the approach of taking seemingly unrelated and random stories of average people from several walks of life, then tying them together into one bigger, more coherent and impactful moral story. There is also a business to movie making – profits, merchandising, advertising the game itself, etc. Nothing is done purely for artistic integrity anymore. Beyond not telling the story of Roc, I don’t think I’d tell the story of any capsuleer. Ultimately, if the movie interests someone enough to play the game, they’re going to find out what it’s like being a capsuleer anyway. 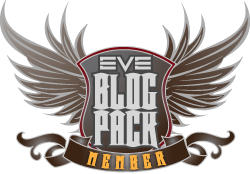 No, I’d rather focus on the rich lore of EVE Online, the vast tapestry that has been established already. Look at Star Wars, Mass Effect, Star Trek, Lord of the Rings, Babylon 5, and any other lasting and impressionable mythology. Yes, the characters are often interesting, and sometimes the story are actually good, but more importantly it is the ability to feel immersed into the universe that is presented to you. If you don’t feel for the characters, if you don’t believe in the universe you’re seeing, then it’s nothing more than an indulgent diversion from life. New Eden deserves more than that. I may have Roc make a brief cameo in my film just to satisfy my own ego, and there may be the passing reference to some historical player moments in the background of a scene here and there, but ultimately I would focus on the regular folks. Who knows? Maybe the catalyst that ties them all together is a capsuleer. Maybe that pod pilot affected each of their lives in a way that isn’t seen until near the end of the story. Or maybe their lives are all affected by the battles of NPC megacorporations and us immortals never factor into it. It all goes back to the fact that there is really just such a rich vault of pre-established knowledge to choose from seo companies. It couldn’t possibly all be fit into even a blockbuster trilogy. So what’s my pitch? I don’t really have one. However, I can tell you with certainty that any pitch I had the chance to offer would be accompanied by an epic soundtrack of my own composition. That should count for something, right? All I know is that if an EVE Online movie were ever done, I would pray it was done right, much like I am doing as you read this regarding the next Star Wars movie from Disney. I don’t know about irony, but your original prank post was part of the inspiration for this particular Banter. I linked it in the BB email as a source. I’m almost disappointed we didn’t get a continuation.